IAAC (Barcelona) is organizing a workshop in Turin (with the collaboration of the Politecnico di Torino) within its IAAC global summerschool self<a>rchitecture program. APPLICATIONS ARE OPEN: click here to apply! Simultaneous collaboration and investigation from all three locations. Abstract: The IAAC Summer School for the 2011 academic year will continue to investigate multiscalar strategies for the (re) construction of our inhabiting environments (home, city, planet). The last few years of technological, social, political, economic and cultural changes (at both the global and the local scale) demand that we rethink what kind of habitat humanity will live in in the coming decades, given that space in all its aspects (landscapes, cities, places, buildings and bodies) is undergoing dramatic transformations. The growing interest in managing climate change, in embracing of the green agenda in urban development, in the development of techniques for local energy generation, in the incorporation of information technology into the physical space and other relevant situations, call for a new vision of the evolution of the city and architecture. This opens up a wide range of possibilities for the development of projects and initiatives that will help transform habitable spaces in keeping with the new requirements of both global and local users. Self<a>rchitecture is an agenda with research and education goals that combines science and technology with architecture and urban planning. Self-Sufficiency, Self- Fabrication, Self-Organization, Self-Design and Self-and Collective Intelligence are some of the key words on which the academic agenda of the programme will focus. Producing Self-Sufficient architectural products means, above all, producing more effective organizational systems. The design of the buildings will have special relevance, equipping them to generate the totality of the energy they consume and creating, where necessary, new physiological and metabolic delimitations of the building. The proposed buildings will be related to a variety of uses (residential, work, commercial, etc) and their users’ needs (micro scale) as well to the specific context and the sum of groups of information (macro scale) Building structures on all three scales will be defined by a set of parameters, which will drive the final designs. These parameters will be generated by geographical characteristics of the specific sites: latitude and longitude, environmental data (temperature, CO2 emissions) and urban context (density, flow of people). The building is thus converted into a micro-city, with all of the strata of a small city, and is understood as a complete organism, plugged into a substratum by the managing of the input and output of local data and characteristics. The final structures will be treated not only as independent nodes but also as parts of a network — a new urban layer. Such networks and their dynamics will be explored with a view to understanding how information affects the construction of the physical world, and how cities and their built elements can be seen as informational architecture systems. The intention is not simply to interface with the built environment but to implement strategies that will transform built environments themselves into information systems. Distributed educational model: The IAAC Global Summer School is part of the IAAC Global School project. The IAAC GS (Global School) aims at generating a dynamic network based on distributed knowledge and collective actions. As part of this initiative, the IAAC Summer School will take place simultaneously at three different sites: Barcelona, Turin and Mumbai. All of the sites will be connected 24 hours a day via videoconferencing to develop the Self<a>rchitecture project through the sharing of knowledge, techniques and experiences. IAAC Summer School participants will have the opportunity to enjoy a unique distributed academic experience, collaborating with fellow students, faculty and researchers from all over the world in an effort to transform Architecture into a tool/platform for rethinking inhabitation (at the planetary, metropolitan, urban, building and habitat scale) by way of a series of new ideas for creating space for human habitation. Participants: The programme is aimed at students from a variety of compatible fields, such as Architecture, Engineering, Fine Art, Design, Landscape Architecture, Programming, etc. 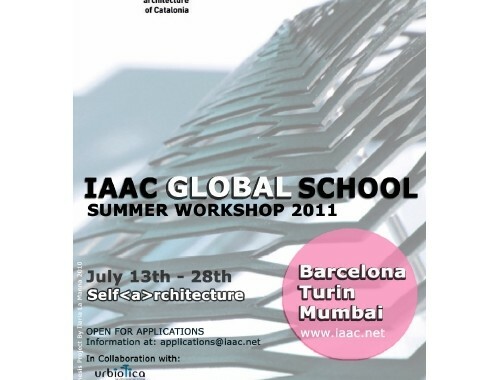 References/Bibliography: Successful applicants offered a place at the IAAC Summer School 2011 will be provided with the relevant bibliography, which should be looked through before arriving in Barcelona. Language: The course language is English, and all sessions, classes, lectures and meetings with supervisors are in English; knowledge of Spanish is not required. 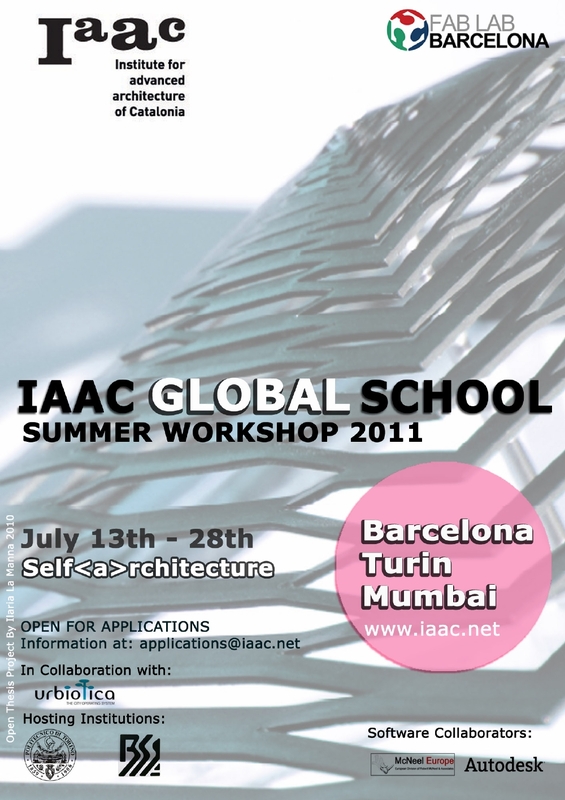 Fee: The tuition fee for the IAAC Summer School 2011 is 2,000 euros. IAAC is a cutting edge education and research centre dedicated to the development ofan architecture capable of meeting the worldwide challenges in the construction of habitability in the early 21st century. Based in the 22@ district of Barcelona, one of the world’s capitals of architecture and urbanism, IAAC is a platform for the exchange of knowledge with faculty and students from over 25 countries, including USA, China. India, Poland, Italy, Mexico and Sudan. Students work simultaneously on multiple scales (city, building, manufacturing) and in different areas of expertise (ecology, energy, digital manufacturing, new technologies), pursuing their own lines of enquiry on the way to developing an integrated set of skills with which to act effectively in their home country or globally. IAAC has carried out research projects in Brazil, Taiwan, Croatia and Romania. In 2008it was chosen to take part in the official section of the Venice Biennale with the project Hyperhabitat and in 2010 it presented a 1:1 scale house (entirely produced at IAAC) at the Solar Decathlon Europe in Madrid where it won the Peoples Choice Award. IAAC has the most advanced digital production laboratory of any educational institution in southern Europe, with laser cutters, 3D printers, milling machines and a platform formanufacturing chips. IAAC organizes the Masters course in Advanced Architecture, directed by Vicente Guallart, Willy Müller and Marta Malé-Alemany in conjunction with the UPC Polytechnic University. The Open Thesis Fabrication course is open to Masters architecture students from around the world. The Fab Academy is part of the global network of Fab Labs affiliated to MIT’s Center for Bit and Atoms. Since 2004 the IAAC has run the Self-Sufficient Housing and Self-Fab House design competitions, and later this year will present the Your City 2109 competition with the aim of generating new paradigms for architecture and the construction of the city in this time of change. IAAC GS (Global School) is an initiative aiming at generating a dynamic network basedon distributed knowledge and collective actions.XXI century humanity goes through several global phenomena with local repercussions.Advanced technological achievements on the one hand and financial crisis together withsocial re-adjustments on the other.Architecture has been long stayed in the limits of these phenomena trying to other usethe latest generation technologies at whichever cost (case 01) or trying to respond tofinancial and social crisis with low budget alternative or traditional techniques (case 02).Case 01 leaded to the generation of an elite group that keeps on producing at high,unsustainable costs involving little of experimentation and much of passive productionambition. Case 02 mainly managed to respond efficiently to single local needs widening, though,the existing gabs between developed and developing realities. In an effort of going beyond those linear approaches IAAC GS tries to transformArchitecture into a tool/platform for rethinking inhabitation (in a planetary, metropolitan,urban, building and habitat scale) through a series of new ideas for creating space forhuman habitation.Based on the idea From Bits to Geography (multiscalar approach) IAAC GS aims tocreate a dynamic network for promoting innovation in architecture. The Fab Lab Barcelona is a research and production center that uses Digital Fabrication technologies for the production and the intervention of our reality. The Fab Lab Barcelona is located at the Institute for Advanced Architecture of Catalonia (IAAC) and belongs to the Fab Lab global network, a project leaded by the Center for Bits and Atoms at the Massachusetts Institute of Technology. Within this network, the Fab Lab Barcelona promotes educational programs related to architecture, design, physical computing and digital fabrication. Fab Lab Bcn consists of 2 laboratories. 1.IAAC and 2.Disseny hub Barcelona Fab Lab Barcelona has the vision to become something more than a machine laboratory making things. Its objective is to become a laboratory of PEOPLE that make things, converting the relationship between machines and humans more fluid. The Fab Lab Barcelona seeks to make the process of design, manufacture and production methods more accessible in terms of knowledge, time and money. The Fab Lab Bcn wishes to establish a closer relationship between technology, architecture and design, and discover ways of how these elements may have a greater impact and value in reality, not only from the economic point of view but also from the social, functional, energetic and human point of view. The Fab Lab Barcelona aims to become a global reference in Digital Fabrication applications, as well as in spreading in different countries, through training programs and implementation of new laboratories. The Faculty of Architecture II of the Politecnico di Torino develops programs in sustainability, construction, heritage, planning and green areas up to MSc level. As part of their official studies careers, students are encouraged to follow international seminars and workshops as a way to enhance best practices. Over the last few years, the School organized a series of international workshops focusing on the themes of parametric design and sustainable architecture. The Balwant Sheth School of Architecture (BSSA) focuses on various modes of architectural education, research and practice. It emphasizes on the ever changing ethos, behavioral sciences, tools and techniques, and assimilates all in a contemporary design expression. In formulating its agenda, BSSA would learn from the past, envision the future, redefine, enhance and integrate the present and constantly evolve. BSSA is a young school based in Mumbai. It offers a five year degree program in Architecture from the NMIMS University and is recognized by the Council of Architecture (India). Urbiotica is the result of the collaboration between Santa & Cole, Grup Iviron and D3K Gestió del Coneixement (UPC, Polytechnic University of Catalonia). Santa & Cole provides the experience and knowhow on urbanism and industrial design so that the new technologies deployed are integrated coherently in the existing urban fabric. Grupo Iviron groups different companies in the ITC sector and provides its experience in the sector of local government. D3K is the R+D core of URBIOTICA and is formed by professors and researchers from the Communications & Signal Theory Department of UPC. Urbiotica solutions give response to many unsolved situations in our current cities, like the unnecessary waste of water for the maintenance of green areas, the problems derived from traffic congestions, the economic burden of urban waste management processes or the over consumption of energy in the street lighting. Urbiotica deploy innovative devices and sw solutions which allow us to gather real time information of different parameters from urban services and mobility, and which in the end improve significantly the existing services in terms of efficiency and quality. The technological devices they market (sensors, data collectors and actuators) are fully autonomous and manage energy so they can function for 10 years without any maintenance. They are designed to be integrated aesthetically and functionally to the existing urban furniture (lampposts, streetlights, etc). Not far from today, we will live in cities capable of processing and communicating information, cities capable of learning, anticipating and reacting to our behavior. Smart cities offering new services to citizens, some of them yet unimaginable. McNeel is a software development company with worldwide sales, support, and training. Founded in 1980, Robert McNeel & Associates is a privately-held, employee-owned company with sales and support offices and affiliates in Seattle, Boston, Miami, Buenos Aires, Barcelona, Rome, Tokyo, Taipei, Seoul, Kuala Lumpur, and Shanghai with more than 700 resellers, distributors, OEMs, and training centers around the world. Founded in 1995, McNeel Europe is the European, Middle Eastern, and African headquarters for Robert McNeel & Associates. McNeel Europe is responsible for sales, marketing, training, support, and localization of all McNeel products in EMEA. McNeel Europe also develops the Penguin and other Rhino related products. Autodesk is working to help solve some of the world’s most complex design problems, from pressing ecological challenges to the development of scalable smart infrastructure. Designers use Autodesk tools to not only create plans for buildings, for example, but also to simulate their impact on the environment and track their performance over time. Autodesk Research is a team of expert scientists exploring and creating technologies to help improve design and its role in society through high-level projects and collaboration with leading research universities worldwide. Autodesk Research is unique in that they are dedicated to innovation and discovery in this realm. The interests range from methods to help users learn powerful digital prototyping tools, to visualization and simulation techniques, which enable designers to achieve new levels of performance. Advancing the state of the art in human-computer interaction, computer graphics, and digital design technology, Autodesk research collaborates openly with researchers at leading universities around the world. Thales Alenia Space is at the heart of the most high-performance space systems and associated technologies (www.thalesaleniaspace.com). It operates in the sectors of Telecommunication, Space Infrastructures and Transportation, Observation and Environment, Space Science, Navigation, Equipment and Ground Systems. In this framework, Thales Alenia Space -Italia displays a unique experience and technological capability to design, build and operate complex systems for life in space, such as orbiting stations, re-entry vehicles and scientific instrumentation. Next generation technologies under development in Torino’s premises include inflatable structures, regenerative environmental control, advanced/hot structures for high performance vehicles, as well as solutions for protecting humans and systems from the space environment. The RecycLAB laboratory of the Torino site is committed to the design, development and test of advanced life support systems to increase the resources recovery from wastes, including physico-chemical and bioregenerative systems. The latter are currently studied for the ability of higher plants to provide food, in addition to contribute to air revitalization and water regeneration. Different technologies, also currently employed in commercial hydroponic crop growth systems, are modified to meet the space application needs. Honoring the memory of Mohamed Omer, IAAC Alumni 2008-09 from Sudan we have created the Mohamed Omer Scholarship that will be offered to the best student application from Africa, to cover his/her full tuition in the IAAC Summer School. The selection of the candidates will be undertaken by IAAC’s admission commission and decided by the directors of the program. Students interested in applying for the scholarship should send along with their application documents a letter of intent stating the reasons of applying for the scholarship and presenting their vision and expectations about the program.